The first boardwalk in the world was built in 1870 in Atlantic City. Earlier this year, New Jersey Gov. Chris Christie signed bill S-11, which authorized the creation of the Atlantic City Tourism District. Through the measure, the state's Casino Reinvestment Development Authority is now responsible for revitalizing the gaming destination's tourism and convention business. In October, John F. Palmieri became executive director of the CRDA, following previous work on revitalization projects in Boston; Charlotte, N.C.; Hartford, Conn.; and Providence, R.I. It was last July that Gov. Christie called for the city's meeting and convention business to increase by 30 percent by 2014. Development firm C Gateway has filed an application with the New Jersey Department of Environmental Protection to build one of two new smaller casinos in Atlantic City with a minimum of 200 guest rooms that state lawmakers authorized earlier this year. The company plans to partner with Hard Rock International on the project, deemed a "boutique casino," to be built in phases on the southern end of the Boardwalk. With an estimated price tag of $275 million, the 850-room property is scheduled to open in spring 2014. The 809-room Atlantic City Hilton Casino Resort no longer is affiliated with Hilton Hotels & Resorts and is now known as ACH Casino Resort. New Jersey's Casino Control Com­mission has approved MGM Resorts International's request for an additional 18 months to sell its 50 percent of the 2,000-room Borgata Hotel Casino & Spa operation in Atlantic City. The extension, through March 24, 2013, is part of MGM's settlement with the state to leave the Atlantic City market because of concerns over the company's business partner in a casino in Macau, Pansy Ho, whose father is alleged to be connected to Asian organized crime. In other news at the Borgata, the property recently completed a renovation of 300 suites. Now in the works is a refurbishment of the rest of its guest rooms and public areas. The project is targeted for completion sometime in summer 2012. Revenues for Atlantic City's 11 casinos declined nearly 20 percent in August 2011 from August 2010 earnings, making it the biggest monthly plunge, year-over-year, in the city's history. The casino resorts were forced to shut their doors for three days on what is typically one of the busiest weekends of the year in late August due to Hurricane Irene; the overall loss in business due to the disaster is estimated at about $45 million. The Atlantic City Convention & Vis­itors Authority has launched a new mobile website featuring four main tabs to navigate events, accommodations and activities in the area, along with copious information about dining. Users who access atlanticcitynj.com from a smartphone automatically will be sent to the mobile site. 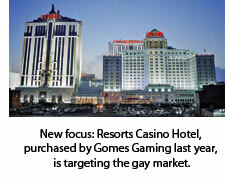 Gomes Gaming Inc. purchased the 942-room Resorts Casino Hotel last year. The property, which has 100,000 square feet of gaming space and 45,000 square feet of meeting space, has hired a marketing director to target the lesbian, gay, bisexual and transgender market and has launched the city's first gay venue, the Pro Club. Landry's, the parent company of Nevada's Golden Nugget Las Vegas and Golden Nugget Laughlin, has purchased the Trump Marina Hotel & Casino. The 728-room property has been rebranded as the Golden Nugget Atlantic City; a head-to-toe renovation is scheduled to be completed this month. The 2,133-room Tropicana Atlantic City Casino & Resort, purchased by investor Carl Icahn last year, has been awarded an operating license by the Atlantic City Casino Control Commission. It was three years ago when the commission stripped the casino of its license following a massive employee layoff that left the property understaffed. The resort offers a variety of meeting spaces, including the 18,000-square-foot Royal Swan Ballroom and the 13,000-square-foot Grand Exhibition Center. Construction of a new 75,000-square-foot federal inspection station currently is under way at Atlantic City International Airport. The facility will allow the airport to pursue international carriers and air-service routes. The project, expected to cost about $25 million, includes a customs and border patrol facility, an expanded baggage claim area that will provide space for customs to process international passengers, and the installation of new passenger boarding bridges. The project is slated for completion in 2012. Seaview, a Dolce Re­sort, reopened this past March following a two-month renovation project. The work mainly involved freshening up all of the property's 297 guest rooms. Last year, this Galloway Township property was purchased by Richard Stockton College, which plans to use part of the resort for student housing. The school also has announced that it intends to develop a comprehensive hotel management program.